Marinate the salmon fillets in a bowl with a tablespoon of olive oil, piri piri (or hot sauce), chopped garlic, paprika, and salt and pepper to taste. Cover it and let it marinate in the fridge for about 2 hours. 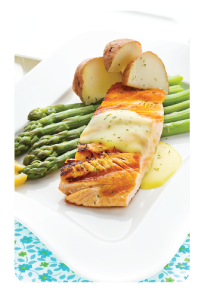 Take out of the fridge and place the salmon on a greased baking sheet, preheat the oven to 350 degrees Fahrenheit. Slice the red potatoes into quarters and season them with salt and pepper to taste and the other tablespoon of olive oil and place on the baking sheet. Chop the asparagus in halves and add them to the baking sheet. Once ready, place the baking sheet in the oven and let it cook for about 23-25 minutes, or until the salmon is well done and the potatoes have browned a bit. Bacalhôa Vinhos de Portugal, S.A., one of the biggest and most innovative wine-making companies in Portugal, has developed a range of wines throughout the years that has ensured a solid reputation and the preference of national and international wine lovers. A family controlled company dating back to the 1920s, they produce wine in the same way we enjoy it: for friends and amongst friends, in our daily lives and in special occasions. The single estate of Quinta da Garrida in Dão is located in Vila Nova de Tazém, with granitic, light and poor soils, typical from the region, this land allows Bacalhôa to create wines with very specific characteristics. Ideally pairs well with traditional Portuguese cuisine. “Deep ruby color. Exuberant nose with light floral and ripe fruit nuances. It also shows some toastiness from the wood where it aged. Elegant palate with notes of ripe fruit. Full-bodied and persistent aftertaste,” winemaker, Francisco Antunes. This entry was posted in Recipes and tagged argentina wine, cooking with wine, dao, food pairing, Francisco Antunes, march wine club, portugal wine, portuguese wine, quinta da Garrida, recipe, red wine, reserva wine, salmon wine recipe, spicy salmon, tempranillo, touriga nacional, wine, wine club, wine pairing, wine recipe, wine tasting, winestyles. Bookmark the permalink.